Neither I nor Laura can quite remember how we first met. It was either that we were cycling together on Mondays and then she showed up in my yoga class, or a gal from my yoga class appeared on the Monday night rides. Regardless, we have stayed friends mostly from sporadically seeing each other around the city, in a yoga class or, mainly, on Facebook. When she saw last week's post about coffee en plein air at Discovery Park, she asked if I'd like to join her in a collective coffeeneuring circle of cycling joy (or something like that). We met up at Voxx Cafe on Eastlake Ave, she on her folding Brompton which she kept neatly (and easily, I might add) folded up beside us and me on my Surly, locked to a nearby rack. 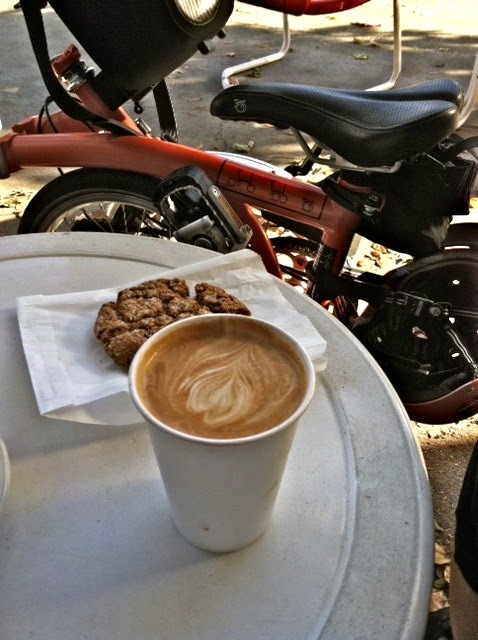 I had one of the cafe's seasonal specials – Cardamom Vanilla Latte and a ginger cookie (I guess I was in a spicy mood). They were both delicious, with not too much spice in either item. 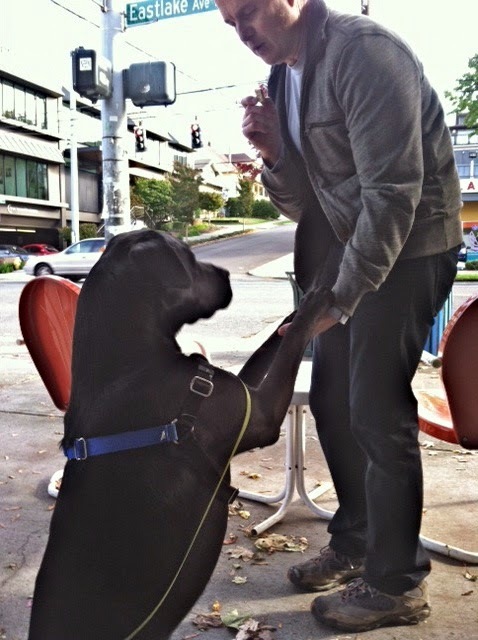 Amid our conversation, a black lab interjected his snout, looking for cookie or at least cookie crumbs. It wasn't until his person disappeared inside and he began to bark that the crumbs made an appearance within the confines of his leash length. We returned plates that were licked clean. After coffee and conversation, we two gals with longtime cycling connections made our way down to the obscurely–named Cheshiahud Trail which encircles Lake Union. We rode the soon-to-be-a-cycle-track area of the parking lot on Westlake Ave, then across the Fremont Bridge, at the north end of which we parted. I am sure our paths will cross again soon.